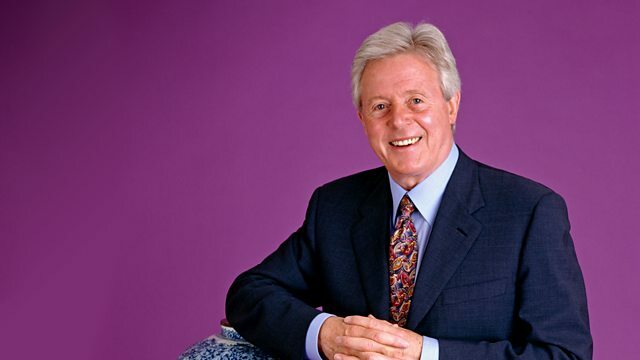 Michael Aspel and the team pay a second visit to East Kirkby Airfield in Lincolnshire. A squadron of classic Morris minors lands on the runway. We're back for a second visit to the former Lancaster Bomber Base at East Kirkby in Lincolnshire. Many good men and women served here, and the last time we came, we were inundated by visitors. We're hoping for the same, of course. Over and out. this must be one of THE classic items. This is a superb smoking compendium. It belonged to my father and it was handed down to me. Did he have any association with the aircraft industry? Was he interested in anything to do with aircraft? He did fly in a Lancaster. this lot would have been arch rivals because this is German, basically. This is a German manufacturer. There are certain places at which it is marked DRGM Germany. It's very interesting, the way it all fits together. Let's open the back compartment, where you would have stored tobacco. which would stop the metal from deteriorating with the tobacco in it. They both come to pieces like this and open up, which is rather clever. there's a superb little cutter concealed in the propeller. Put it in there, spin the prop and cut the tip off. Then we've got a nice set of little ashtrays which could be spread out. There they are, nesting ashtrays. and a collection of matches inside. Now what's superb about this example is that it's so complete. Often they're damaged or you find part of the ashtray's missing or whatever. -How has it survived so well? Have any of you ever smoked, or did you father smoke at all? Yes, my father and mother smoked. Did they use it as a smoking compendium or was it an ornament? -I think they did, you know, occasionally, yes. And what would you say on date? Would you have any idea of the date? Um, well sort of 1930s. That's about right, about 1925-1930. It says much about the period, attitudes of the time. value is a difficult one. and I think this is worth in excess of £2,000 at auction. Which is a staggering amount of money for a smoker's compendium. and it's been a pleasure talking about it. These are great. Do you know where they come from? The only idea I do have, apparently, many, many years ago, they stood at an entrance to a circus. And how long have you had them? I've had one, this one, for about 12 months. -And that one for roughly about ten months. And did they not come together? No, they didn't, no. We bought this one first. I managed to buy him off him. -Then he informed me that he was one of a pair. -And the pair came back together. and you can see on the other horse, there's also another vertical bar. -in an enormous carousel, which would have been a sight, wouldn't it? -It certainly would have been. patch that's been crudely repaired where some child would have mounted the fairground horse like this. and a lump would have fallen off, and some person has simply nailed on that haunch piece. I think they're absolutely brilliant. do you mind me asking you how much you paid under a year ago, for each of these? £600 for the pair, yes. Well, I've got two questions for you. Do you know what these objects are called? And what are used for? Unfortunately, I've absolutely no idea what they're used for and I've no idea what they're called. and really finished by the end of the 18th century. something made out of wood in front of a hot fire, the result is pretty self evident. and on that basis, do you know where they've come from? and to date, no-one's come to claim them. Really? There's quite a good story about these. and had been so frightened she thought the British had arrived. Perhaps we might have done better in America if we'd had a whole load of cut-outs. -They're in a store room. So they're not actually in situ in a great house somewhere. No, they're just in an open room. trophy of arms over there and these two figures were flanking it, to get that sort of military air about them. and the uniform of these soldiers is almost identical. and they were the elite troops, the storm troops of their day. I think that they are sufficiently important for somebody to have them conserved and cleaned. making between £5,000 to £10,000. -You just don't see them, they're so rare. Better not use white spirit on them. -and then they'll suddenly step out bright, as if they were painted yesterday. They are indeed. Thank you. Now I don't think I've ever seen an object like this. When I first saw it, I thought "is it a postcard album, is it a photograph album, what on earth is it?" and it's German but it's in English. we see the selection of the dyes, all the types of carpets being made, very high-quality carpets. which I think is fun, we actually see them in sort of what you might call a domestic context. -They're saying in the 1930s, "you in your smart villa, you need our carpets". you know, Axminster, Wilton, they'd all fit into there with ease. What I don't understand is where you come in. and married the owner of the factory. So from behind the bar, she became, in a sense, a carpet empress. -Do we know anything about her? -What did she look like? because the house in which they lived was also a show home for the carpets. And there are some photographs here of their silver wedding anniversary. and this is Leo Koch, the owner of the factory. -And this is silver, 25 years. -this must have happened quite early on, that they met. -I think in the, early 1900s. but eventually had to come back before the Second World War because of the Nazi regime. -So she was never a naturalised German? He stayed in Germany during the war and died during the war, so they never met again. So this is, in a sense, the end of the story. It is indeed, yes, and unfortunately they didn't have any children. -So that was the end of the line? It is, it's quite fascinating, it's part of the family history. How do you descend from them? They had no children. so the family history's on my grandfather's side. over to this country, including this gold bracelet. -So this was sent from Germany for the family, in effect. Well, that's an expensive gift, you're looking at several hundred pounds. I believe so, it has been valued today at £300 to £400. So you've talked to somebody who knows about jewellery. It just looks a jolly good thing. -So they were sending, casually, several hundred pounds' worth of gifts at Christmas. It was a grand family, and this, if I've understood, this is their house. This is the house in which they lived. Well, we can do the comparison. -..in which they lived. How big was the house? -It's, er... right at the beginning there. -It is quite a sizeable house. -It's quite substantial, isn't it? -I think this alone is a wonderful document about the carpet industry in Germany. But when you've put that sort of personal detail onto it, I find it so exciting. Suddenly, this wonderful but rather impersonal document comes to life, you know, she lived here. -She sat at that dining table. £200 or £300, I'd be tempted to buy it, because it's such a wonderful vision of that industry at that time. -In a sense, this doesn't matter. and it tells us a story about incredible enterprise and also how she rose from nowhere. -Good Lord, a whole squadron of Morris Minors seems to have landed! So what is your role with this crew? -come along today to welcome Antiques Roadshow to East Kirkby. And is it a thrill now to see the Morris Minor on the pre-title for each Antiques Roadshow? Absolutely, it's displacing that make we won't mention. -The foreign rubbish, you mean? Quintessential British car for a quintessential British programme. Quite right too. And how many years have they been making the Morris Minor? -and it went right up until 1971. -So there's going to be quite a celebration coming up in 2008 then? -we're hoping to have a rally with up to 2,000 Minors at Stanford Hall in the Midlands. So that should be another day to look forward to. And how many of these motor cars do you think have survived in this country? -be restored, brought back to life again. -Lurking in a barn, a garage. What about the international aspect? It went all over the world, didn't it? the African territories and even into Europe. So where are you off to with the squadron now? and enjoy the reminiscences of a great day. -Good for you, it's been extremely nice to meet you and safe driving. -We will do, thank you. and you bring me in a picture of a Lancaster bomber, so tell me about it. The picture is of a Lancaster bomber of 617 Squadron, the famous Dam Busters. Mickey Martin, Geoff Rice, Les Munro and, of course, Bob Knight. Yes. So this was issued as a print, some, what I don't know, 30 years after the event. Now you must have done a lot of research. Whose is that? which was their nickname for the aircraft. Thumper Mark II. I think that's great fun. broken the surface of it, but I don't think that really matters, it's all part of its history. probably the last time they all met up together, what do you think? -Because quite a few are dead now, aren't they? and I think that that probably was their last full meeting. in memory of their fellow squadron members. -Douglas Bader and Group Captain Johnnie Johnson. ..in the Second World War, absolutely fantastic. Well, the one I obviously like most, the one I'm keenest on, I have to say, is this one. -If we have to put a value on it, and I suppose we must, that must be a very rare set of signatures. somewhere in the region of £300 or £400, possibly more, but it is a very fine collection. with the signatures of Bader and Johnnie Johnson I would put that in at about £100, £150. -Great to see them, and great to be under this enormous bomber. It's wonderful, isn't it? Thank you very much. Do you live in a really seriously grand house? They don't, yeah, they don't belong to me, they belong to me grandma. -And does she live in a seriously grand house? Because these are the kind of objects I'd expect to find in a seriously grand house. Do you know where your grandmother got them? he knew she was interested in antiques and things. So he went to see her and she purchased them, but she can't remember how much she paid for them. Right. I mean, do you know what they are? Yeah, do you know who made them? I think they're probably Sevres. She thinks they're probably Dresden. Right. And you know the Sevres mark, the interlaced Ls mark? Only because of the S underneath, that's what I was going on. Ah, so if we have a look at the base of them to see exactly what there is, yeah, there we go. S48. Well, I'm pleased to tell you they are Sevres. 48 refers to 1848. Do you know much about the Sevres factory? Not really, I've heard of it, that's all. established under French patronage, making very, very best quality wares for the very best and richest people. -So these are not rubbish. combination of biscuit porcelain here and glazed porcelain here and here. this mid-19th century period is doing quite well at the moment. -It was a slightly earlier one. it didn't have this wonderful colouring, this wonderful painting. we could say as an auction estimate probably £8,000 to £10,000 for them. She does know I like them and I've got my eye on them. They're truly fabulous objects, the very best of 19th century Sevres porcelain. During World War Two, Lincolnshire was known as "bomber county"
because it had more airfields and squadrons and aircraft than any other part of the United Kingdom. As well as local people, several members of our team have close family connections with the area. Bill Harriman, your dad was stationed around here. driving around Lincolnshire picking up bent aircraft. -There would have been a lot of bent aircraft. also, not for just the remedial work of mending bent aircraft, but improving their performance. -So he collected a few medals on his way. -and then they make a lovely piece of family history. -Do you want me to value them for you? Oh, it would be very kind of you, and I might even just follow my own advice before I'm much older. alive, and it was only after he died, when I was rummaging through his effects, that I came across these. I think it was the Second Air Force, that was sort of over and above. Well, he certainly made his mark. How did the young Bill Harriman get involved in militaria? that I should not have any involvement with was firearms. and my father had these pistols and I remember discovering them in a box in the garage. I was in absolute heaven and I've never looked back. -He must have had a few casualties amongst the audience. -Well, one hopes he used blanks. So coming here today for you is quite an emotional experience. about his experiences and it's very much a sort of sentimental journey. I'd love you to tell me about this brooch. How long have you had it? It was my mother's. I think Dad bought it for her. -As a 50th birthday present. -Fantastic! And have you worn it? Well, I tell you, it is just such a wonderful piece of jewellery, I have never seen anything quite like this. -and this has everything going for it, so your mum was quite a mover. -Was she quite a mover? -I think so, in her day. the baguette-cut diamonds that are dangling from each of the fuchsia stamens. -This is also giving me an indication of the date of the piece. So I would date this at around about 1925-1930.
which is to be worn to be shown off. it's just fantastic, so I would say that in auction you'd be looking at around about £4,000. What a highly decorated box. We rather think it might have come from my mother's family. commissions in kind rather than cash and we think that's probably how it came into the family. You don't remember seeing it as you were growing up? until we packed my father's house up just before he died. Gosh, how extraordinary, so your mother didn't like it, what do you make of it? Well, we love it and my wife in particular loves it. Well, I think the nice thing about it is that it incorporates such good quality materials. and then to top it all off, these lovely little plaques. Do you know what they're made of? Well, we think it's probably Wedgwood, is it? also used quite a lot to decorate furniture and boxes of this kind. I'm dying to open it up. What a stunning tea caddy. a really good retailer's name in it. "Howell & James & Co, Regent Street, London". and selling really high-quality objects exactly like this. So we know that it's a tea caddy, because, helpfully, on the plaques here is written "black" and "green"
That is... That is absolutely remarkable. I don't think I've ever seen that on a tea caddy. -Did you get an awful surprise when you first opened it? Yes, yes, thought it was a jack-in-the-box. Let's have a look at the other one. It must have been a patented sort of mechanism. Look at that. although the whole thing sort of oozes quality. It has to be worth £1,000. Really? Goodness me! Never thought it was worth that much. -but, you know, I just can't see it fetching any less than that. Well, it's obviously found a good home and I'm glad it's found somebody who appreciates it and enjoys it. but it does have a great deal of charm. -Um, it belonged to my mother-in-law. -and that's what I chose, and I really liked it. tea drinking was quite at a premium. and used to keep the tea in caddies locked up because it was something like £1 a pound in those days. But, of course, the Chinese did not have milk with their tea and so this was a purely British invention. What intrigues me about this particularly is the way it's hallmarked. which is the 1730 period mark. And where does it live at home? For the last couple of years it's been wrapped in a piece of kitchen roll in a drawer. Oh, that's a bit sad. and I just didn't really know where to put it or what to do with it. £500 and £600 and should be insured for something like £1,000. but you've brought us something smaller. is slightly different to that one, because that bomber is Guy Gibson's. -The very famous Dam Busters. -The very famous Dam Buster one. I notice it has the bouncing bomb underneath. -and it flies, or it did, but I have to ground it because it's too valuable now. -And why do you like Lancasters, what's your background? Oh, well, I worked for AV Roe in the war. -So you were actually an engineer? -So you were actually making these aircraft. -Did the plans, reduced them. -And you made all this by hand? -so this is the result. -And you also brought us along some flying gear. it's not like the Irvine one, the British one. This is American. But this is British, isn't it, the goggles? they did 30 trips over Germany. -So you know the history behind who owned it? By brother-in-law was a pilot, with 44 Squadron in a Wellington. they turn up quite regularly at auction. They do but the helmet's usually anything from £100 to £170 just the helmet without the goggles. And what's the value, do you think, on the American jacket? -You're pretty close. You know your values. Because it's incredibly difficult to get them in this condition, and being American. Now the model, it took you 2,900 hours, did you say? it would cost tens of thousands of pounds. It is a one-off, it is a unique model. -All the gearing works, the navigational lamps work. It is the one that everybody remembers, the Dam Busters Lancaster. £10,000, £15,000, £20,000 but it's a unique piece. So, who knows? -Hopefully one day it'll end up in a museum, because that's exactly where it should be. -Thank you so much, it's been a privilege to meet you, sir. Well, two quite different pots, two different owners. that is they're both for funeral purposes, they're funerary jars. Yours is this one, tell me a bit of background. my husband's mother's side and her grandfather found it near Newark. -When you said "found it"... In the ground? Right. How do you feel about owning someone's funerary urn? You're not spooked by it? I'm not spooked by it, no, no. and, you know, you feel proud to own something like that. And yours? This one here. Well, it was dug up in 1956 in Peru. Do you have any Peruvian personages? some 6,000-7,000 miles between Lincolnshire and Peru. is almost certainly a portrait of the person who went inside the pot. hands sort of stretched up and the anatomical details on the pot. Well, let's put him back - or is it a him? -these objects which were found in the pot, I think, I think it's almost certainly a female burial. You've got two objects which, I have to admit, I don't know what they're for. Well, some sort of spinning. It looks as though it has something to do with spinning or thread. but they are beautifully made, these tapered sticks. what, 500 years without any mal effects. so we're now going back to somewhere around what, 500, 600, 700AD, thereabouts. I love this because I have seen people in New Guinea to this day, making pots like this. This pot has been made by using a coiling method. a very tight wall, the wall builds up and eventually it almost automatically encloses on itself. and it's something that has been going on for thousands and thousands of years. we would know very little about the huge area of humanity. -so you can't put a value on them. -I think that the value of these is somewhere in the region of £1,000 each. Well, this is a tiny little ring. Where did you find it? -and I dug down and I noticed this yellow thing, thought "ha it's not rusted, it's gold". that there was an inscription on the inside which said "keep promise"
but keep promise not as we would write but "kepe"
so I looked for the spelling, in that spelling on the internet to see whether it was a family motto. Mm, that's a good one, that's very good. writing back to somebody in England and uses the term "kepe promise". -So I thought, oh, is it 16th century, ah, you know. But beyond that, that's as far as I went. Well, I think you're on the right track, to be perfectly honest. This is a posy ring, and posy is a corruption of "poetry" and they're very short, almost poems. some are very full-on messages of love and some are more formal. This is actually a little bit more formal, it says "kepe promise"
and I think 'kepe promise' is a sort of vow in marriage. I mean a tiny little woman. and they simply didn't grow in the way that we grow today and so it sort of fitted her. and black and white decoration is very very much a part of Elizabethan and Jacobean decoration. and it's sort of transporting for everybody. And these things are very widely collected, so how to value it? I think it's very cheap at £1,250. Things like that happen to other people. No, they don't, they happen to you, mate, and not to me! I'm very envious, I dream of finding things like that. -This is pulse-makingly exciting stuff and I love it, and thank you for bringing it. Got you all emotional now, hasn't it? Well, another successful mission for the Roadshow. and to everyone who joined us for the day. And now from the big skies of Lincolnshire, goodbye. Michael Aspel and the team pay a second visit to East Kirkby Airfield in Lincolnshire. A squadron of classic Morris minors lands on the runway. A ring found in the roots of a tree flabbergasts the experts.